Snuggle in with your special someone (or just escape from the madness of the world) while lying on this luxurious bed with a pocket-spring mattress, wrapped in 400-thread count, 100-percent Egyptian cotton linen. 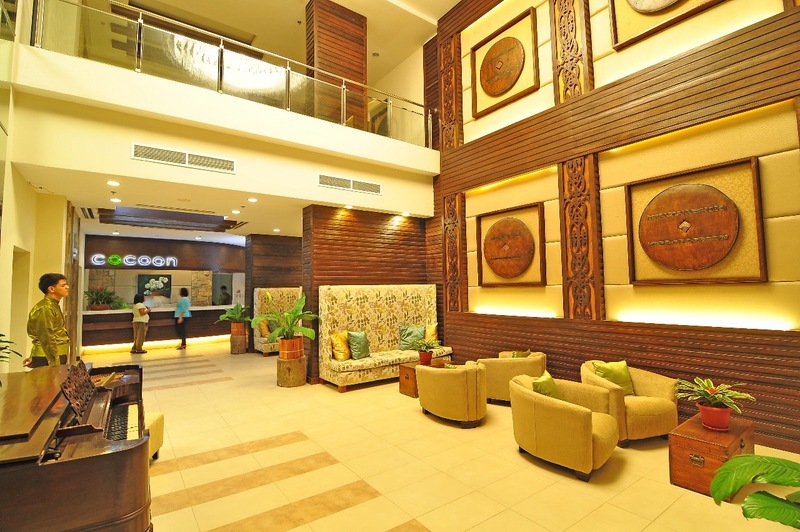 The name “Cocoon” is quite apropos for this new 40-room boutique hotel in Quezon City. 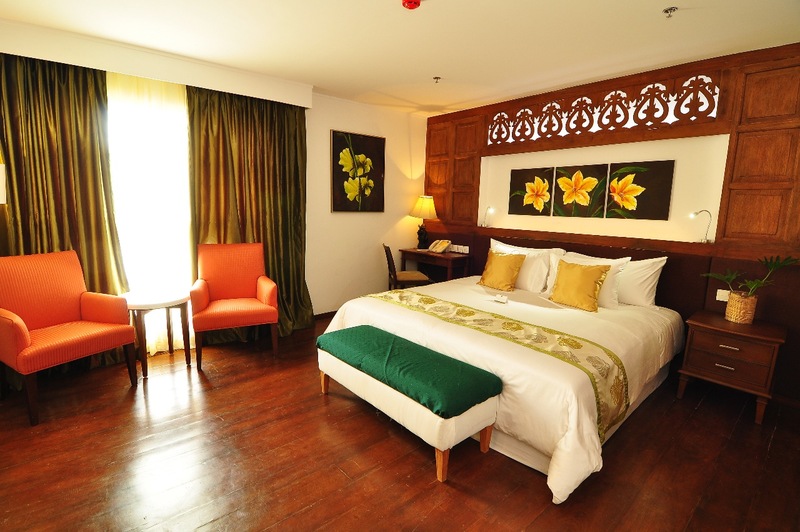 Just opened late last year, Cocoon envelops its guests in comforting quiet luxury with its tastefully appointed rooms and public areas, and an attentive and courteous staff. Concessionaires on the ground and second floors also provide services to address guests’ dining, entertainment, or wellness needs. So guests don’t even have to leave the hotel to rest, relax and entertain themselves—quite literally, their world is complete in this “cocoon”. What is admirable is how so much thought and care for the environment was put into the design of the building, making it possibly the first “green” hotel in the metropolis. It uses only LED lighting throughout the building, has an active waste-segregation plan, inverter airconditioning to cool the guest rooms, a linen-and-towel reuse program, and eco-certified organic bathroom amenities, to name a few. Also, large glass windows allow natural lighting into the public areas and guest rooms; rain and ground water is used to flush toilets, irrigate plants and general house cleaning; and much of the building’s construction incorporated reclaimed wood, metal roofing and steel grills of the old on-site structure. With the hardwood pieces recycled from old houses and lighting fixtures previously used by a five-star hotel, the Steven Leach-designed interiors of Cocoon evokes a kind of lived-in, Old World splendor amid a modern tropical setting. Lounge around in the warm, inviting lobby in tropical hues. The wall on the right features carabao cart wheels framed in ventanillas from old houses - a repurposing theme carried throughout the hotel. The lobby itself, done in swathes of welcoming white and brown, was a great respite from the dusty wind and noise of careening cars in the main avenue’s traffic outside. An 1800s-era Steinway grand piano stood on the left of the entrance, and on the right comfortable lounging chairs and couches with tangerine pillows beckoned me to take a load off. The wall at the lounging area features carabao cart wheels as art pieces quaintly framed using ventanillas from old houses—a repurposing theme carried throughout the hotel’s interiors. Hanging up above from the lobby’s high ceiling was a dazzling Murano chandelier—what a breathtaking delight! Three more such chandeliers can be found in the hotel’s ballroom on the rooftop deck. The suite I was booked in was spacious with a regular-sized sofa, a writing desk that was part of a long slab of heavy darkwood which also served as a shelf for one’s things, and a 32-inch LED TV. Adjacent to bedroom is the bathroom with a shower area and a bathtub over which is a glass window with shades that one can lower for privacy. It was such a joy to sleep on the pocket-spring bed and snuggle with the circle-of-down pillows wrapped in 400-thread-count, 100-percent Egyptian cotton linen. It’s just the kind of bed you’d want to spend lazy days in. So despite the high-speed Internet access in the room, I didn’t switch on my MacBook even once. On the rooftop is a bar/café overlooking a small pool where simple breakfast fare is served each morning. Eating my beef tapa, sunny-side up egg and sinangag while chatting among friends under the canopied dining area, I could almost forget I was still in the middle of a bustling city. What a relief to be insulated from the bedlam outside! Snuggle in with your special someone (or just escape from the madness of the world), while lying on this luxurious bed with a pocket-spring mattress, wrapped in 400-thread count, 100-percent Egyptian cotton linen. The ballroom, with those sparkling Murano chandeliers, can accommodate about 250 guests—large enough for your daughter’s giggly guests at her 18th birthday party, or an intimate wedding reception. It can also be divided into two function halls, which these days are often used by government agencies for their seminars and team-building efforts. There’s so much to do in this hotel. I checked out one of its concessionaires—Iris Spa—and had a vigorous Swedish/Shiatsu massage while splayed out on the spa’s heated bed. Its rates are quite reasonable, and the massage therapist assigned to me was quite efficient in her kneading of my tired knotted shoulders and back. Another interesting space was Paire Cocktails and Pastries, owned by a young chef and her sister, which serves deconstructed desserts inspired by cocktail drinks. I also had my nails done at Peps Silvestre Salon, which I am told has celebrities from the nearby TV networks among its regular clients. So that’s a great bonus for those into celebrity stalking...uhm, watching. Other concessionaires include Abuela’s Coffeeshop, The Mulberry Flowers & Gift Shop, Il Duelo Italian Restaurant, My SerendipiTea Milk Tea Shop, Nouvelle Aesthetic Clinic and Triple Star Travel Agency. You really don’t have to leave the hotel to eat or have some refreshments, get a facial, or even book another vacation to some faraway destination. Because of the hotel’s strategic location, guests in a partying mood can also swing by the nearby Timog Avenue and the Tomas Morato area to immerse themselves in the hubbub of nighttime entertainment and festivities. Ah, but all good things must come to an end. I wish I could’ve stayed longer, but work and domestic duties called. 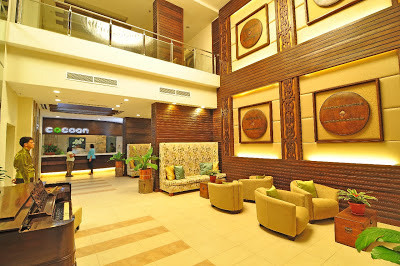 But I’m comforted by the fact that Cocoon is just 20 minutes away from my home, and if I ever need to escape from people and backbreaking deadlines, I know just where to go. 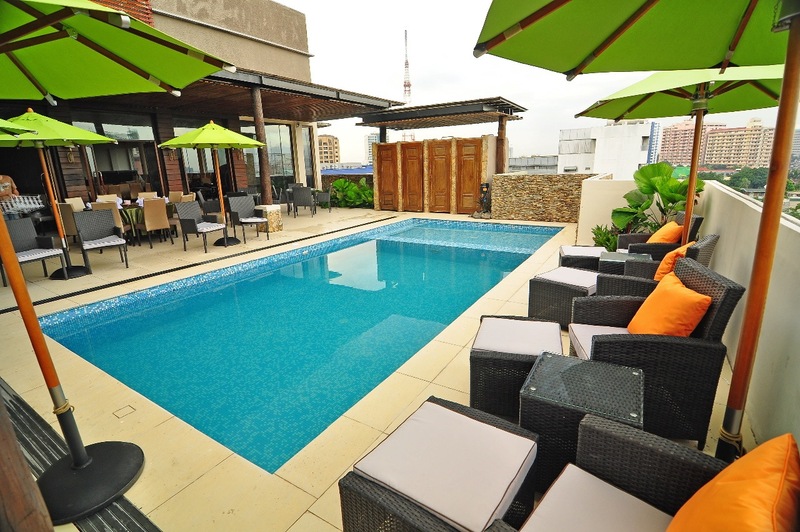 Take an early morning swim on the roofdeck pool, before having breakfast of simple Filipino fare.